The nation's immigrant (foreign-born) population has grown considerably in recent decades. In 2014, the number stood at over 42 million based on the Census Bureau's American Community Survey (ACS). 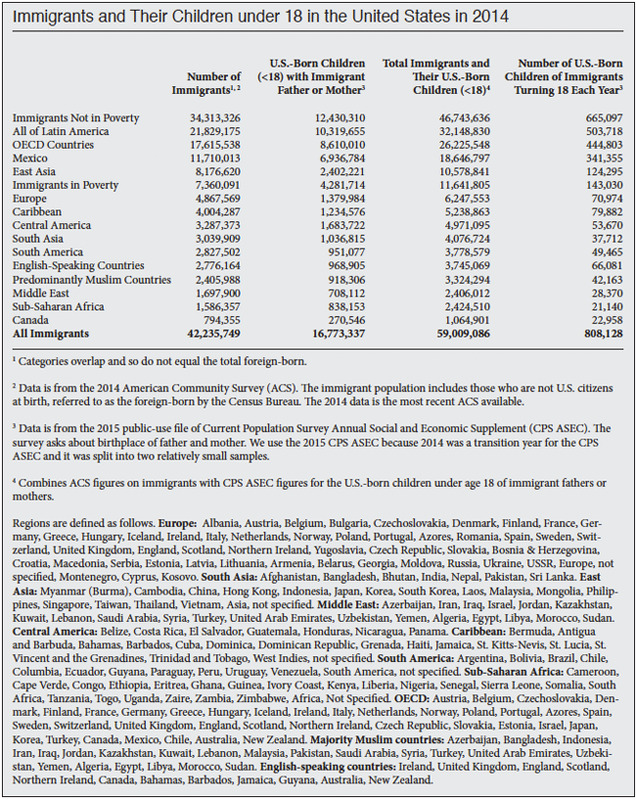 In addition to the immigrants themselves, there are also their U.S.-born children. The ACS does not ask respondents about their parents' birthplace, but the bureau's Current Population Survey (CPS) does. There are 16.7 million U.S.-born children (under age 18) with either an immigrant father or mother living in the country. The table below reports figures by sending regions and other categories. In total, 59 million immigrants and their children under age 18 live in the United States, accounting for roughly one in six U.S. residents.